The culmination of the legendary pilgrim’s trail Camino de Santiago (Saint James’ Way), the magical medieval city of Santiago de Compostela has been one of the Christian world’s most important pilgrimage sites for centuries. With its piercing spires, elegant palaces, and romantic plazas, some say it carries the distinction of being the most beautiful city in Spain. While that claim is a hard one to prove, there is no denying the magnetic appeal of Santiago’s mix of majestic medieval architecture, a buzzing café culture, and a storybook historic center where ancient monuments, modern boutiques, and wonderful restaurants rub shoulders along narrow cobblestone streets. Santiago’s compact old town is a work of art crowned by the soaring Romanesque cathedral, built between the 11th and 13th centuries in honor of Santiago (Saint James), who believers say was buried here in the first century AD. When his remains were rediscovered in the 9th century, Santiago became an important pilgrimage site, drawing the faithful from across Europe. Even today, more than a millennia later, the Camino de Santiago, which begins in France and stretches across northern Spain, is one of the most beloved and most used pilgrimage trails in the world. It’s living a modern renaissance, with thousands of hikers and cyclists taking to it every year. Gourmet travelers also follow the Camino de Santiago route across Northern Spain, visiting wine country and monuments en route – La Rioja, Basque Country’s Txakoli and the exquisite region of Asturias with its Cider and artisan cheeses are all on the way. The pilgrims’ reward upon reaching Santiago is a modern city-village that still clings tightly to its medieval past. The city reached the height of its influence in the 11th century, but its role as a pilgrimage site assured it steady growth and a wealth of churches, monasteries, and palaces for hundreds of years more. Even today, there are more than two dozen churches, convents, and monasteries open for visits in the city center. But history and austere old buildings aren’t the only things Santiago has to offer. Thanks to the presence of the 16th-century university, one of Spain’s oldest and most respected, there is a lively student culture and a buzzing nightlife. The old city center is packed with atmospheric bars and pubs; some of the best spots for drinks are found around the Rúa da Congo, the Rúa San Paio de Antealtares and the Plaza de Cervantes. Even during the day, Santiago boasts one of Spain’s best café cultures, with wine bars, coffeehouses and old-timey cafés packed along its cobblestone streets. Just outside the city are the lush green forests of Galicia (this area is called “Green Spain” for a good reason! ), creating the ideal place for rural getaways or walks. A bit further on is the breathtakingly beautiful Galician coast, where rías (inlets) score the shoreline. Rias Baixas is the famous wine country here, where the fabulous Albariño wines are produced. Tiny fishing villages, remote beaches, and busy resorts are dotted along these picturesque rías can all be enjoyed of your tour of Santiago de Compostela and the region of Galicia. Nowhere in Spain (or perhaps in all of Europe) will you find such delectable shellfish and seafood as in Galicia. As the region’s capital, Santiago de Compostela enjoys even better cuisine than other cities. 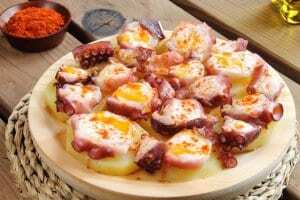 From ocean-fresh prawns, shrimp, crab, and lobsters to local specialties like Galician octopus (boiled and served with cayenne pepper and Olive Oil) there is a little something for everyone. The seafood here is most often served either boiled or grilled, which allows its natural flavors to shine. One exception is “Caldo Gallego”, a savory stew made with beans, potatoes, turnips, and smoked pig fat; light it is not, but this winter staple is a delicious regional favorite. Galician wines are the perfect accompaniment to typical seafood dishes. The crisp and fruity Albariño wines from the Rías Baixas DO seem created to combine with shellfish. Also look out for wines from the other Galician Dos- Denominacion de Origen, i.e. appellation-: Ribeira Sacra (known for its delicate red wines), Ribeiro, Valdeorras and Monterrei. In the city center, head to streets like Calle Franco or Calle Raiña to find excellent eateries. If you’re looking for rustic charm in spades, don’t miss the El Asesino (“The Killer”), a homey mom-n-pop restaurant that’s been serving local specialties for 130-plus years. To ooh and ah over the raw ingredients, make a stop at the Mercado de Abastos, the city’s main fresh market. A superb Romanesque creation begun in 1075, this is the heart of Santiago. It’s said that St. James’ remains were buried here in the 1st century AD and rediscovered in 813. Today visitors line up to kiss his statue, which sits behind the main altar, and to hear mass in this wondrous place. To dig into the local culture, visit this interesting museum, which has exhibits on everything from boating and fishing to music and pottery. If you’re interested in the history of the Camino de Santiago, check out this museum that explores the pilgrim culture, an important part of Santiago’s history. One of Spain’s oldest and most emblematic institutions of higher learning, the University is a popular spot to visit. Seek out the 16th-century Colegio de Fonesca, formerly a monastery and home to a beautiful university library. There are usually exhibits held in the two ornate rooms at the front. The royal hospital, built in 1492 to service pilgrims coming through the city, is now the elegant 5* Parador Hotel. The Plateresque and Renaissance architecture here makes it worth a visit, even if you decide to stay elsewhere. Santiago’s maze of a city center is broken up with lovely plazas, big and small. Seek out the Plaza de las Platerias, so named for the many silver shops (Plateria) found here. The Plaza de la Quintana, near the Cathedral, is a popular place for taking photos, thanks to the lovely views of the cathedral towers.